Introduction to security topics for your web services. Note: In documentation, abbreviations are used sometimes. AuthN – or authN – is an abbreviation for authentication. AuthZ – or authZ – is an abbreviation for authorization. [This article] gives a general overview of authentication and authorization in ASP.NET Web API. As a web programmer, you have some experience with security-related coding tasks. In BTI320 / INT322, you designed and created a credential store, to hold usernames and passwords. In addition, you coded a login form, and the credential validation process. An access control list based scheme was used to protect resources. In BTI420 / INT422, you used the ASP.NET Identity components to do most of the work described above. The Authorize attribute was used on controllers and methods, and you learned that the security infrastructure took care of controlling access to resources. But in general, how does security work? The most common scheme in web apps – and used by ASP.NET Identity – is that the credential validation process creates an HTTP cookie. The cookie holds information about the authenticated user, but does not include sensitive or secret data. After a successful login, the server delivers the cookie with the response, and the browser saves the cookie in its cookie store. How do you know this? Login to an ASP.NET MVC web app. Then, use the browser’s developer tool or inspector to examine the cookies collection for that web app/site. You will see a cookie named “.AspNet.ApplicationCookie“. The browser will include the cookie with every subsequent request to the web app/site. How does security work for a web service? Well, a user does not use a browser to interact with the web service. Therefore, we cannot use an HTTP cookie. Instead, an access token is used. Instead of using an HTML Form for login, a requestor will send a specially-formatted “login” request to a resource in the web service. The credential validation process creates an access token. Like a cookie, an access token holds information about the authenticated user, but does not include sensitive or secret data. The token is delivered as the response, to the requestor. The requestor must then take some action to save the token. In this section, you will learn about a project’s security components, by creating and inspecting a project. For best results, create a new Web API project that uses Individual User Accounts. A project that’s based on the “Web API project v2” template meets this specification. Also, download and open the ProjectWithSecurity code example. It has been marked up with “Attention” task list tokens, so be sure to open/display the Visual Studio Task List too. Look at the Startup class, in the App_Start/Startup.Auth.cs source code file. When the app loads, security components are loaded and configured. It assumes responsibility for the authentication task. It loads and configures the authentication component, to work with bearer tokens. You have noticed that all of your web service projects include an IdentityModels.cs source code file. It includes an ApplicationUser class, and a data context. When the database is accessed for the first time, the security components cause the security-related database tables to be created. The Account controller has actions that enable a user to register for a new account, and other tasks. Next, study the account binding models, for objects sent to the account controller as parameter arguments/values. Finally, study the account view models, for objects returned by account controller actions. The ApplicationOAuthProvider class (in the Providers folder) performs authentication-related tasks. The app’s “token endpoint” – at URI http://host.example.com/token – is mapped (by default) to the GrantResourceOwnerCredentials method. 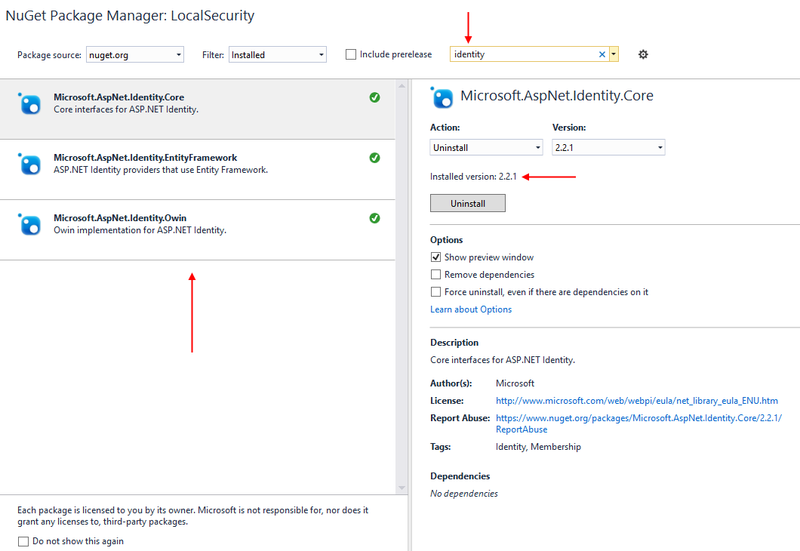 ASP.NET Identity adds a number of security-related components to a project. The components can be configured. The functionality of the components can be accessed through a number of objects that are already present in a project, and in security-related objects that are added. In your ASP.NET MVC web apps programming course, you learned how to create a project that included security components. You also used the register and login forms, and maybe some account management functions. In the project’s source code, you also learned about the built-in components. When controlling access to resources, you learned to use the Authorize attribute. Note: You can refresh your security topics knowledge by reviewing the professor’s class notes from the web apps programming course. Read and study the March 24 class notes. More content was in the March 26 class notes. Most students will recall this topic from their ASP.NET web apps course. After a successful authentication, the authentication process (on the server) will create a data package and return it in the response. The data package includes information about the authenticated user, but it does not include sensitive or secret data. It definitely includes the user name, and the user’s claims. If the authentication was initiated by using a browser and a web app, the data package that’s returned is an HTTP cookie. Alternatively, if the authentication was initiated by using an HTTP client (e.g. Fiddler), the data package that’s returned is an access token. On subsequent requests, the data package – cookie or token – is sent with the request. In a web app, the browser handles this task automatically. When you are using Fiddler (or programming an HTTP client on, for example, an iPhone app), you must do this task. When a web service receives a request with a token, the security infrastructure validates the token. If valid, it creates an IPrincipal object, and attaches it to the request. That way, information about the authenticated user is available to your code, as the request makes its way through the request-processing pipeline. In your code, how do you get access to the authenticated user information? The User property. In a repository (or manager) service layer module, it’s the HttpContext.Current.User property. Also, if you want to determine whether a request is authenticated, the HttpContext.Current.Request.IsAuthenticated property will tell you. In the next class/session, we will start to go beyond a project’s “embedded” security components, to take advantage of modularity, portability, and scale. Make sure you prepare for that class by studying the class notes and the linked and recommended readings. Also, we will have Test 7. A reminder – there are ten (10) tests in this course. Tests 7 through 10 are scheduled for the next four (November) Thursdays (November 5, 12, 19, and 26). Lab 7 has been published. It is due next Monday, November 9. It will enable you to implement some security topics and principles.